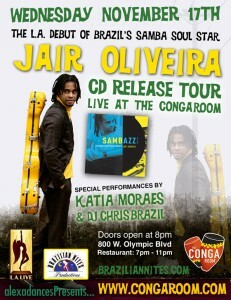 Jair Oliveira at the Conga Room - Brangeleno - Brazilian Culture in L.A.
On his CD release tour Jair will be stopping in LA at the Conga Room. What sets Oliveira apart from the country’s crop of new stars is the breadth of his talent-singer, composer, producer and multi-instrumentalist, and the depth of his experience. Jairzinho (“little Jair”), as he was affectionately known, has been performing and recording since age six, first alongside his father, and then as part of a hit TV show & band Balão Magico (selling over 10M albums by his mid-teens). After receiving a formal music education at Berklee College of Music, and exploring in NYC during the height of R&B/neo-soul resurgence of the 90s, he returned to São Paulo and has remained a leading force in the Brazilian music industry since. Jair has produced over 17 albums (3 Grammy-nominated) for artists like Tom Zé; composed countless songs for MPB stars such as Seu Jorge and Ed Motta (who referred to him as “the most influential songwriter to come out of Brasil since Edu Lobo”); and released 5 of his own, critically acclaimed albums. He also starred alongside actor Rodrigo Santoro in the popular film Os Desafinados (and is featured on its soundtrack); has written theme songs for cult-followed Brazilian telenovelas; and authored a children’s book & CD (also Grammy nominated), which has since been adapted for stage and is playing in theaters across Brazil, with Jair and his wife, famed actress Tania Khalil, leading the cast. 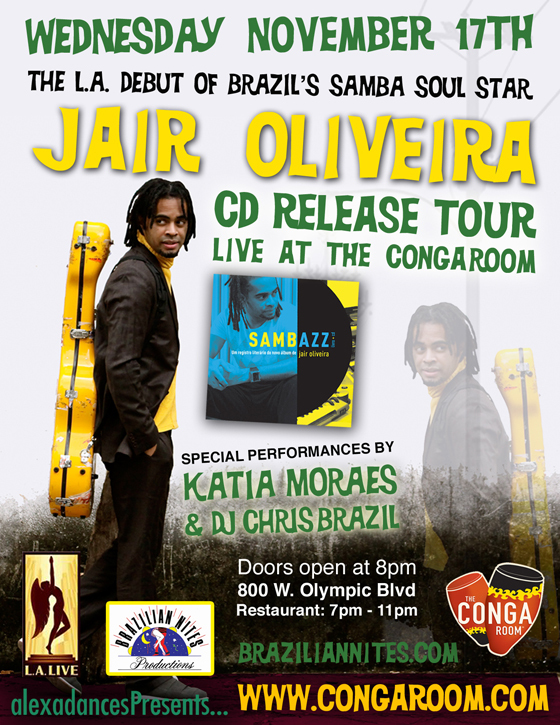 This tour marks the release of Jair’s 6th solo album, Sambazz-which as the name suggests, explores further genre blending, and includes everything from a bilingual bossa nova ballad and to a danceable,funky ode to soccer fans, destined to be a theme song of the next World Cup. Next Entry: Carnaval 2011 – What’s the haps? Do you individuals have a fb fan page? I regarded for one on twitter but could not discover one, I would love to turn into a fan! Next Entry Carnaval 2011 – What’s the haps?